For many of us, it all began with Hot Wheels' 1:64th scale die-cast cars. They were relatively inexpensive, and collectible, and plugged our young fertile minds into the cult of car love even before we could fully understand what that meant. As adults, we now see how important those formative influences were, enough that we can appreciate the toy brand's efforts to continue to engage the maturing enthusiast with its long-running Hot Wheels Legends campaign. Launched in 1968, Hot Wheels began with its original "Sweet 16," cars that are said to be among some of the most iconic in automotive history. 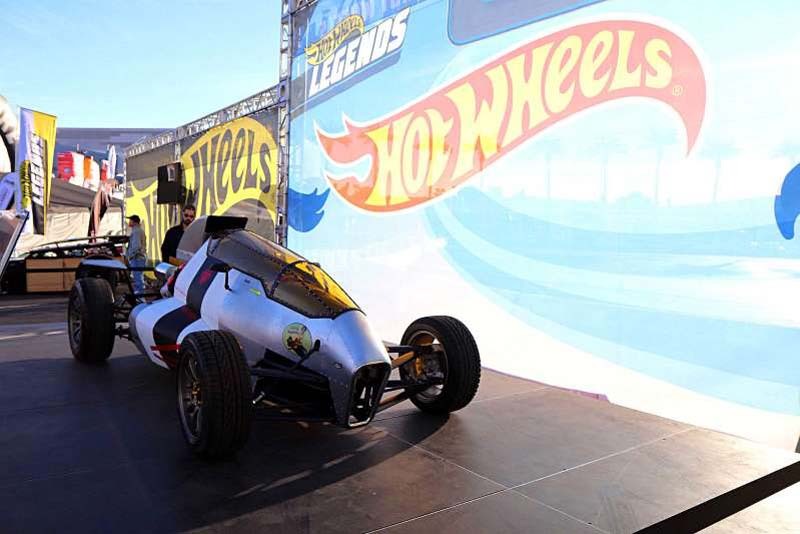 Today with its Legends tour, Hot Wheels aims to add to those fabled machines and others, visiting 15 cities in 2018 and selecting a winning custom car from each stop. 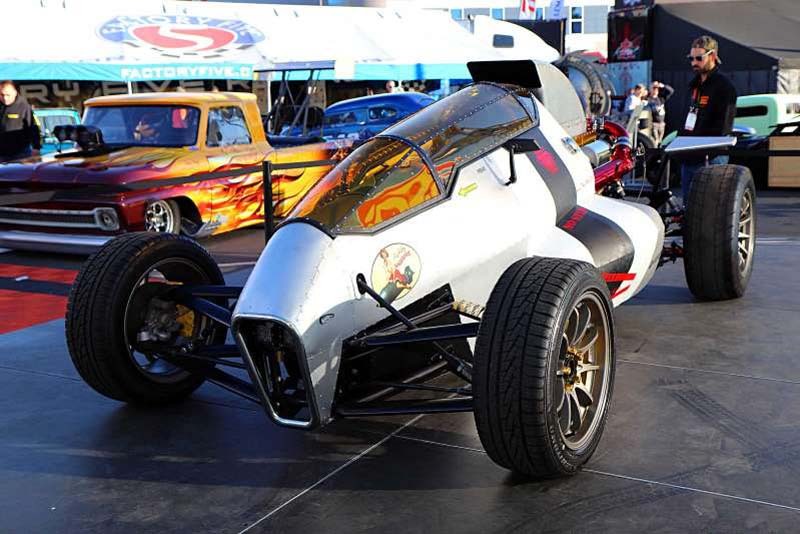 All of that winning machinery was brought out to the SEMA Show in Las Vegas, where one lucky winner was immortalized as a Hot Wheels Legend: Luis Rodriguez's 2JetZ! We featured the Toyota 2JZ-powered, fighter plane cockpitted creation in September, and feel a little good about ourselves for being ahead of the curve on that one. Built on a Nissan 300ZX platform, the tube chassised, fender-less single-seater sports a WRX STI six-speed gearbox; custom molded 6061 aluminum skin; a custom Lexan canopy; and weighs an astonishing 1,600 lbs.—and with well over 500hp at the rears, it probably can move like a bat out of hell, too. We especially dig the Volk CE28s at each corner—nice touch! 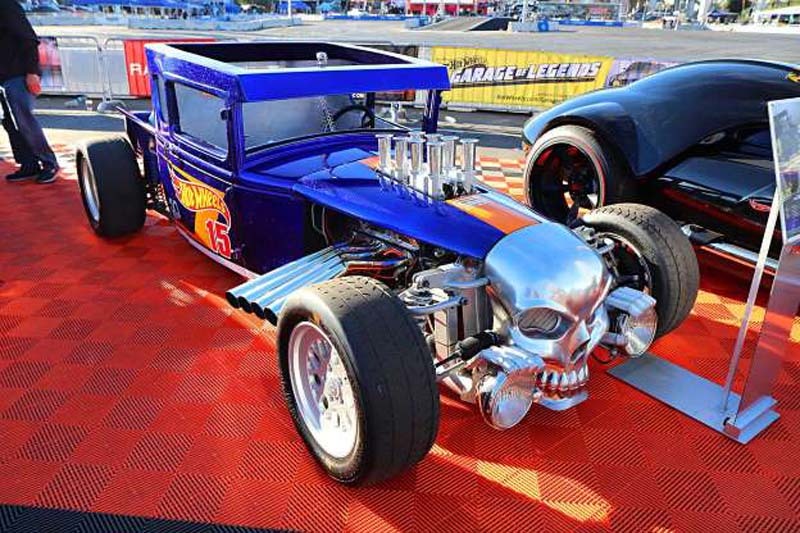 For triumphing in the Legends contest, Rodriguez's 2JetZ will join the HW fleet in miniature and get its own die-cast version that'll be sold around the world—be sure to check out our story on the project car for more about this unique machine. 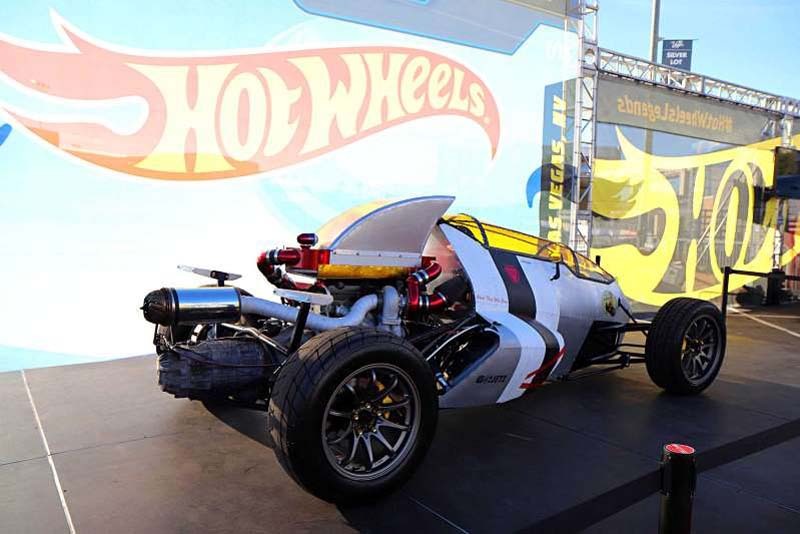 The 2JetZ straddles that line between the sublime and the ridiculous, and in Hot Wheels' SEMA booth it seemed like cars were either one or the other. On the stunning end of the spectrum, we had exhibits like Dylan and Bill Brinkworth's Saisei 1973 Datsun 240Z and Nestor Mendoza's Hakotora. The bagged S30's father-and-son designer and builder duo hail from Seattle, Wash., and their car rocked a bored and stroked L28 mill with cam, custom vertical triple carb intake, and custom titanium exhaust; the Saisei DB240Z is also outfitted with custom Dylan Brinkworth fender flares and rear spoiler, and powder coated Atara Racing Pisang wheels, 15x10.5 inches, -32 offset, wrapped in Nitto NT555 rubber. Mendoza's old-school pickup from Dallas, Texas, is equipped with an HKS-cammed 16-valve 4A-GE engine swap, corresponding AE86 T50 transmission with short-throw shifter, Keihin FCR41 racing bike carbs, and an Autosport Labs ECU; it rides on front 240SX suspension with Techno Toy Tuning tie rod ends, rear leaf suspension with 4-inch drop block, and 14-inch Riverside Riverge wheels with prototype 09Racing carbon fiber turbo fan wheel covers and Toyo Proxes T1R UHP tires all around. 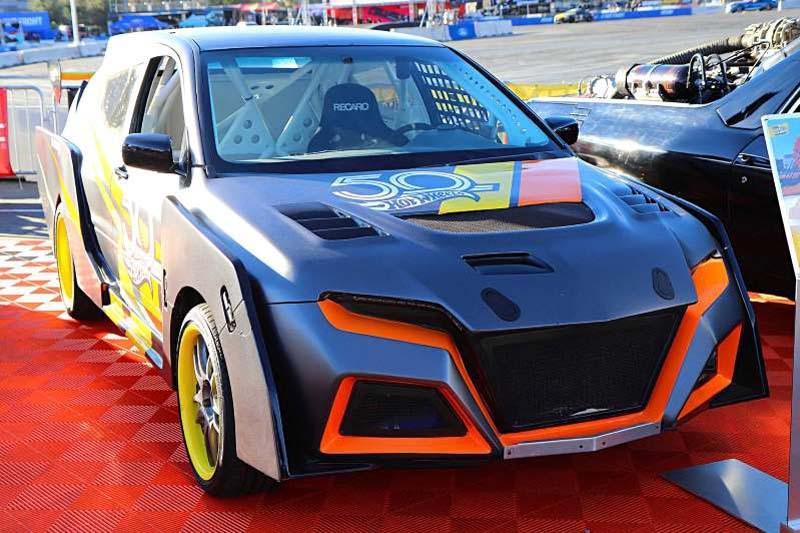 Things get a little less relatable to the real world by the time we get to the Mitsubishi Lancer Evo-based gray "Loop Coupe," one of a couple of record-breaking vehicles that made it through a 66-foot tall real-life loop at the 2012 X Games in LA. The rest of the cars in the exhibition that we gravitated to tended to be way over the top in one sense or another, whether that's Bone Shaker's "skull grille," Twin Mill's two blown Chevy 502 big-block engines protruding from the car, or Never Enough's equally ludicrous bottle fed and supercharged 355-swapped Geo Tracker. Our favorite display, though, was AJ Bohatta's completely period incorrect Medieval1, a wacky build dedicated to the Middle Ages. It rides on air and boasts another blown 355, but you won't remember that; it'll stick in your noggin because of the custom cobra snake headers, armaments that consist of battleaxes and a rear mounted cannon, and a helmet-shaped cab that also comes with air conditioning. Whenever anyone says "life-sized Hot Wheel," this type of literal translation is the first thing that usually pops into our head.